We’d love your help. Let us know what’s wrong with this preview of The Shark Net by Robert Drewe. To ask other readers questions about The Shark Net, please sign up. This is a witty, funny and traumatic memoir of Robert Drewe growing up in Perth in the 1950s & 60s. There are some incredibly funny bon mots and turns of phrase that had me cackling in my seat. It is evocative of an Australia that is not more (actually a world that is no more). Until the iron ore mining boom, Perth was an isolated oversized town on the edge of the continent. Drewe writes: a city of branch managers for companies with head offices over east. And that would sum up the upper busi This is a witty, funny and traumatic memoir of Robert Drewe growing up in Perth in the 1950s & 60s. There are some incredibly funny bon mots and turns of phrase that had me cackling in my seat. It is evocative of an Australia that is not more (actually a world that is no more). Until the iron ore mining boom, Perth was an isolated oversized town on the edge of the continent. Drewe writes: a city of branch managers for companies with head offices over east. And that would sum up the upper business echelon of Perth; so small fish in a smaller pond. It is a city of conservative niceness: of worrying about your public face, especially with any scandal such as a police record for public drunkenness or teen pregnancy and marriage, mixed religious marriages and so on. In actuality, this would sum up Menzies' Australia and would equally be at home in any of the larger southern Australian cities. The difference is the open living - the huge time devoted to being at the beach- and to the fact that quickly everyone knows each other, especially if you are middle or wealthy class. Connections made at school will permeate into your adulthood. And it does in Drewe's case. He knows a serial killer personally; the man used to work as a lower employee for his father: he has been to the house to deliver furniture for a company function. And he has grieved for one of the murdered victims - someone he knew at school and had met in the street a few days before the murder. In such a claustrophobic society as Perth, it is easy for many people to have a personal connection to the violent crimes committed. The killer is good at covering his tracks, and only due to a misunderstanding with his wife (she accepted his womanising & thought he was visiting mistresses) that he managed to escape capture for so long. The writing is light as we follow the growing pains of Drewe & the transition to adulthood & the inevitable change in relationship with his parents. All is done with wry humour and good writing. My only complaint, and it is a minor one, is the jerky nature of his jumping around 6 months to a 12 year in cases. I listened to this & I suspect it is more jarring than when read. I don't remember very much about this book. I purchased it in a bookstore in Rome, one of the very few books in english they had, and read it while riding trains up through italy, germany, switzerland, and holland. Outside a coffee shop in venice a young couple from australia saw me reading this and they knew the book. We drank some beers and had a laugh that night and i felt the world a bit smaller and a bit safer and a bit easier to abide. That being said i remember nothing of the book itself. 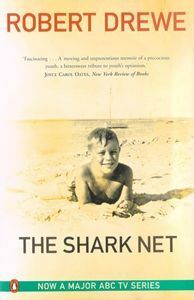 The Shark Net won three Australian prizes in the year after it was published and was praised highly in reviews by writers such as Joyce Carol Oates, Peter Carey and Jim Crace. A reviewer in The New York Times compared Drewe's Perth to Camus' North Africa - 'blinding in its brightness'. Drewe conveys the essence of childhood and adolescence in this hot, isolated city, where most outdoor life is lived by the sea or the wide Swan River. He writes economically and creates vivid images of people and The Shark Net won three Australian prizes in the year after it was published and was praised highly in reviews by writers such as Joyce Carol Oates, Peter Carey and Jim Crace. A reviewer in The New York Times compared Drewe's Perth to Camus' North Africa - 'blinding in its brightness'. Drewe conveys the essence of childhood and adolescence in this hot, isolated city, where most outdoor life is lived by the sea or the wide Swan River. He writes economically and creates vivid images of people and events. The story threads move in scenes; some alive with dialogue, some descriptive, some reflective. In most of them, Drewe and his immediate family and friends are in close focus, but in several chapters the murderer takes the stage. Many of the events he writes about are highly emotional, both within his family and in his community as eight people are murdered by a serial killer. One childhood friend is a murder victim; two others die. But Drewe keeps the emotional tone of his writing subtle. 'Nuanced', Peter Carey calls it. 'Deft' and 'beautifully structured'. It's also a great read. I've just picked up a copy of The Body Surfers by Drewe, ashamed that I haven't read him before. I saw Robert Drewe speak at a literature conference of a number of authors back in school, and it spurred me on to read this book. Captivating and wonderful-should be considered an Aussie classic. I read the first few chapters... then flung the book across the room. That's how good it was. Incredible read, amazingly written. Not what I was expecting at all, but really glad I picked it up. Highly recommended. I've known of this books existance for many years, but had never got around to reading it until now. A great book, based in my home town, it is intresting to read of events in the time that my mother would have been hearing of them and living them. I love that the author knew people involved in the crimes, and the insight to the way people thought at the time (a child born out of wedlock, is more shocking than a couple commiting audultry??) is facinating. Love the book, anyone from Perth West Austr I've known of this books existance for many years, but had never got around to reading it until now. Engagingly written and insightful snapshot of Perth in the 50's and 60's. Finally found a WA book actually about Perth and not set in the country somewhere! I read Robert Drewe's Grace quite a few years ago and I've been meaning to read something more by him for a while. Rather than dibbling into more fiction, I've come to his memories, The Shark Net. These cover the first twenty or so years of his life, growing up in Perth, Australia in the 40s and 50s. A very different world from my own childhood, both because I come from a completely different decade, and, from the north of England, the other side of the world. It was an interesting, and honest re I read Robert Drewe's Grace quite a few years ago and I've been meaning to read something more by him for a while. Rather than dibbling into more fiction, I've come to his memories, The Shark Net. These cover the first twenty or so years of his life, growing up in Perth, Australia in the 40s and 50s. A very different world from my own childhood, both because I come from a completely different decade, and, from the north of England, the other side of the world. A well crafted memoir of growing up on the West Australian Coast through the 50’s and 60’s. The time is set when Eric Cooke was murdering people and breaking into homes across Nedlands and Cottlesloe, and these events follow the authors growing up. The authors family life is intriguing and I felt could have been explored more. There’s dysfunction there. 3 Stars possibly a bit mean for this well written and regarded memoir. It was odd reading a memoir about someone I had never heard of, but a recommendation from a friend was all I needed. Drewe is clearly a skilled writer, because even the most mundane tales of his childhood were a pleasure to read. A natural storyteller, Drewe gives you a sense of the 1960 in Western Australia. The story of the serial killer is woven in nicely with the story of his growing up. All I can say I live in Nedlands and this is a very cool glimpse into Perth life then (and to varying degrees now), but knowing the addresses of where people were murdered (which are NEARBY) is incredibly disconcerting. For someone who moved to Perth in the 90-ties, it is a very interesting and informative read about well known suburbs and beaches of Fremantle and Perth in 1950, 6o-ties. Good to teach. Less entertaining to read in the current political climate. Still makes me yearn for the years we lived in Perth. It was a good read but some parts were a bit long. I live in Perth so it was definitely eerie reading about places I am familiar with. Growing up in 1950s-60s Perth. What a laugh. But how things can change. R D top writer. Not what I had expected. Interesting read all the same. The murder happened when the author was already a fully grown man working as a journalist and the boy who was murdered was also fully grown by that stage and about to embark on a veterinary science course. The murderer was someone who had worked for the author’s father and occasionally made deliveries to the family home but who had long before been fired for theft. And it was a full nine months between the murder and the murderer being identified and arrested, during which time the author had no knowledge of who the killer was. The memoir is actually 233 pages in before the story gets around to the man he knew murdering a boy he also knew. Everything before that is a well-written memoir of a very ordinary life. Most everything after that is as well. So I felt a little bit cheated. I thought perhaps it was going to be a fifty/fifty split between a memoir of the author and a history of the killer. It was more like ninety-nine/one split. There are so many memoirs of ordinary people these days that offer insights into particular periods in history but lack any important historical reason for having been written. Yes, the murderer the author vaguely knew was the last man executed in Western Australia before capital punishment was outlawed. But so what? The author’s connection was tenuous. My cousin once dated a man who would later go on to murder his mother and stepfather and it has never once occurred to me to write and publish my average life story on the pretext of that connection. Other than these gripes, The Shark Net is a perfectly fine memoir. The author writes well and conveys perfectly a sense of what it was like to live in Perth during the 1950s and 1960s as a child. But it’s nothing more than that. I can somewhat identify with the author of The Shark Net as I moved to Perth at a young age, grew up there and then moved out as soon as I could (but I came back after some years!). Robert Drewe has written a beautiful memoir about the positives, negatives and challenges about living in one of the most isolated cities on earth. It was unusual for me to actually recognise street names and locations in a novel, since so few good ones are written about Perth. What was most poignant for me was his analysis of Perth society - it's bitchiness, insularity and conservative nature. Up until about 5 or 6 years ago Perth was still very much like described in the book, very 'clicky'; although it has progressed with leaps and bounds in the past few years (thank god!). Anyways, I loved the sparse writing and Drewe's ability to convey the emotions and feeling of both himself as a youth and also the feeling and atmosphere of the city. The intense sense of fear, and loss of innocence of the city through the real-life Eric Edgar Cooke is well described and makes for fascinating, if somewhat grim reading. As a relatively 'laissez-faire' liberalist, some of the attitudes of the book are pretty eye-opening and make me appreciate how far society has opened up and embraced non-conformity. The most poignant one was the fact that Robert's dad barely acknowledged the birth of his first grandson; contrasted with Roberts' neighbors in Watermans who were happy for him and invited him in for a drink. In fact, Roberts' parents attitude to the whole unplanned pregnancy was pretty shocking but then I guess that is going back a long time. The Shark Net, By Robert Drewe, is an excellent example, or more accurately a memoir, of 1950s and 1960s Perth. A world as written in the novel no longer exists, where everyone knew each other, scandals would become public quickly, the open-living and everyone would worry about their public appearance. A significant aspect of this novel is Drewe's close relationship to the killer. Robert knew the man full well, working for his father and bringing in furniture to Robert's house, and how the event The Shark Net, By Robert Drewe, is an excellent example, or more accurately a memoir, of 1950s and 1960s Perth. A world as written in the novel no longer exists, where everyone knew each other, scandals would become public quickly, the open-living and everyone would worry about their public appearance. A significant aspect of this novel is Drewe's close relationship to the killer. Robert knew the man full well, working for his father and bringing in furniture to Robert's house, and how the events described in the novel would change Robert's Life. What's significant is the lurking danger of this world, that no longer exists, being so close to you for so long. Robert Drewe is among Australia’s most loved writers – of novels, memoir and short stories. His iconic Australian books include The Shark Net, The Bodysurfers and Our Sunshine. He is also editor of Black Inc.’s Best Australian Stories annual series. Recently, he has revisited the short story himself, with a masterful new collection, The Rip. Jo Case spoke to him for Readings about storytelling.